In the 1970s, a wave of young Western hippies descended on the beaches of Goa in India. Forty years later, some of them reconnected on the social network site Facebook and planned a reunion. This event, and the Goan hippy community then and now, are the subjects of a documentary called Goa Hippy Tribe, produced by Australian documentary maker Darius Devas. 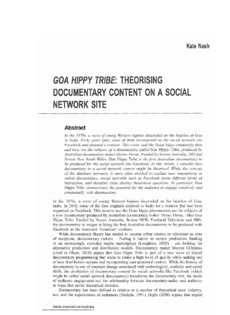 Funded by Screen Australia, SBS and Screen New South Wales, Goa Hippy Tribe is the first Australian documentary to be produced for the social network site Facebook. In this article, I consider how documentary in a social network context might be theorised. While the concept of the database narrative is most often invoked to explain user interactivity in online documentary, social networks such as Facebook invite different forms of interaction, and therefore raise distinct theoretical questions. In particular, Goa Hippy Tribe demonstrates the potential for the audience to engage creatively and communally with documentary.